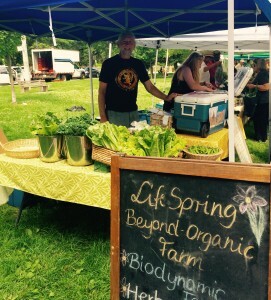 Ken Hancherow from Life Springs Beyond Organic Farm believes in a holistic approach to farming. My chat with him was both enlightening and educational. 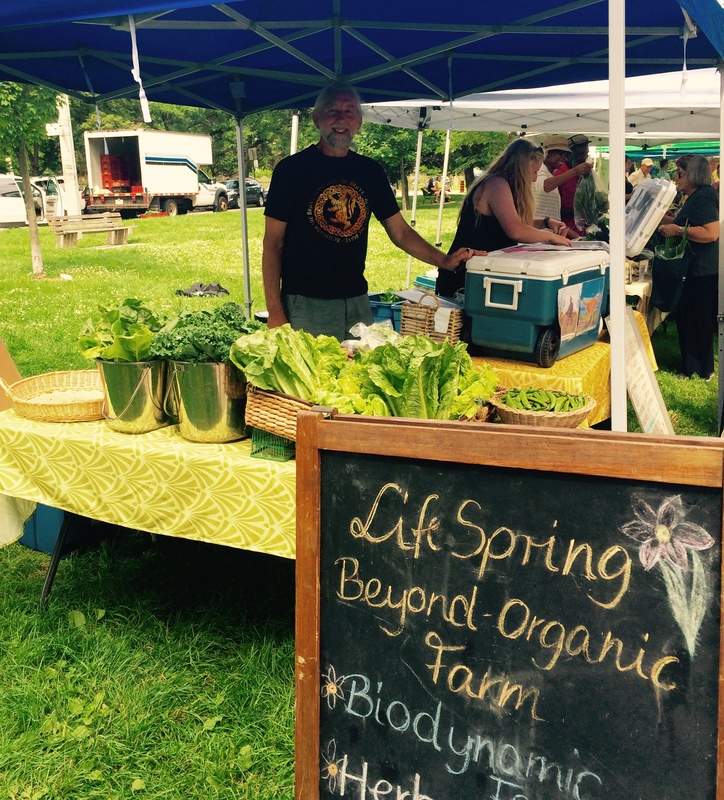 Stop by his booth next week and pick up his amazing Scottish highland beef or some freshly picked veggies. Michelle: Ken, we would really like to know how you got started farming. Michelle: That’s technically a chemical! Just as bad. Ken: They said it’d be out of the soil in a week. So I did my homework and found out 28 days later 98% is still there. One of the reasons I moved out there was to be an example of what a small farm can do without Monsanto. So in the end I decided to learn how to farm. I talked to farmers, googled everything, and learned everything I could. I wanted to get my cows – now I have 35 Scottish Highlands – and also to grow vegetables for a market farm. Previously I was in the health field as a health practitioner, and I worked with energy medicine, interested in it in relation to humans. Michelle: And you applied that to the cows? Ken: I applied that holistic approach to the soil, the animals, the land, and the water. Michelle: The holistic health of the whole system. That’s great. Ken: Ya, so I’ve gone from not knowing anything, and not wanting to know what regular farmers do in terms of the mono-cropping, to trying to be different in what I do. I wanted to be really organic and realized I needed animals to be organic and fell in love with the Scottish Highland cows. The more I got into having animals, the more I loved having the cows, and that became a focus for me. Michelle: So this is your full time job- not music anymore? Ken: All of it’s a full time job. I go to bed at 4 in the morning and get up before 8. I go to bed musicians’ hours and wake up farmers’ hours. I’m always doing research. I’m passionate about all of it. Part of the holistic model that I’m after is researching biodynamics – I’m a biodynamic farm. I plant according to the cycles, spray my plants with biodynamic sprays – that’s why we are called beyond organic – its much more than just not spraying with chemicals. With the meat, I’m differentiating myself because the Scottish highlands have 33% less fat than any other. Michelle: Yes! When I had the sirloin from you last week it had practically no marbling throughout it, but it was still so tender and really flavourful. Ken: That’s because they have long fur, so they don’t have to put fat on for the wintertime. They’re just a leaner cow genetically. They’re also grass finished. Michelle: Most farms that are grass fed fatten their cows up at the end with grain. Ken: Exactly, I don’t do that, but it takes me 6 months a year longer because of that. It’s a lot longer. Michelle: But it’s worth it! Ken: Well, it differentiates me from everyone else. There are not many other farmers that do that. Michelle: That’s great Ken. Okay, One last question: What would you say is your favourite Ontario produce right now, and how do you like to eat it? Ken: The beets we had the other day were amazing. I love steamed beets. I make a huge pot of borsch in the fall – I’m of Russian / Ukrainian background – load it up with lots of everything – beet greens and cabbage and all that. Michelle: That sounds amazing. Well thank you so much Ken! Its been so interesting talking with you. Tanya Spasic from Animal Liberation Kitchen is serving up some delicious vegetarian options at the farmers’ market each week. We got to chatting about why she started her business and her passion for doing what she does. Michelle: Ok Tanya, we just wanted to know how you began with Animal Liberation Kitchen? Tanya: Three years ago I started as a food vendor. But how it really started was me having kind of a guilty conscience. Not doing enough for animals. I’m really drawn to rescue groups and animal rights issues. Coming from when I was young and being very sensitive to animals, trying to save as many as I could but still eating meat – I didn’t connect those two. At some point when my daughter was a teenager she decided to be vegetarian, so I decided to change our whole household lifestyle and I got into cooking! Since becoming vegetarian, cooking has a deeper purpose – I’m cooking with love, cooking with compassion – I started enjoying it and realized I really love cooking. I began making soups – I love making soup. Michelle: That’s how I started cooking – making soup! It’s my favourite thing to make, definitely. Tanya: I made one of my homemade soups and my son said to me – “Mom, this is so good you should sell it”. So I thought – Oh! I should! I thought we should have something like home cooks coming together and sharing their food. So I applied to be a vendor at the Toronto Underground Market at Brickworks and they accepted me. I thought – wow – this is possible – I can do this! Tanya: So that’s how we started. It was so much fun being somewhere where people try different food, enjoy, and get together as a family. Michelle: And the validation from providing people with something they get excited about so much would have been so great for you. Tanya: Yes and we do have a mission. Our mission is to feed people less meat and show them that a plant based diet can be tasty and healthy. Selling one meal means one less person eats a portion of meat. We are not pushing the vegetarian diet or judging. 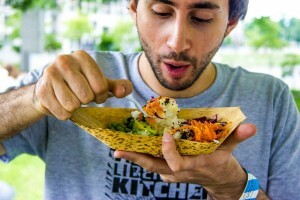 Michelle: Just showing people that vegetarian food can be inventive and delicious. Tanya: Yes. And giving people other options as well. Feeding people who are not vegetarian, and still love my food. Michelle: That’s a great philosophy. Not being too pushy, but still educating people about the options of vegetarianism. Amazing. So this is full time for you then? Tanya: I work in a school, so this is my summer job. I’m a special education assistant, mostly autistic students and I do this in the summer. The feedback has been amazing, feedback is what keeps me going. I feel confident in a year or two I will just do this full time. I have a facebook page and I have more than four thousand followers. Michelle: That’s an huge following! Good for you. Alright, so just one last question – what is the greatest lesson that you have learned from your work? Tanya: That you need to have a mission – a goal. You can’t be guided by profit. It takes time to succeed and grow your business. I love talking to people, I learn how I can grow my business from feedback, especially places like farmers’ markets. Being able to connect to people and learn from them. I really appreciate your choice of vendors at the Cabbagetown Farmers’ Market. We can trade beets and fruit for the food I make, learning from each other – its amazing. Michelle: I love that aspect of farmers’ markets, being able to connect with your food. Well that’s great! It was so nice talking with you Tanya.